The security conversation. The data breach at Target, the U.S.’s third largest retailer, in late November/early December of 2013, resulting in the exposure of up to 40 million customer credit and debit card numbers, will be a wake-up call for C-suite executives across North America and around the world.To date, this is the most visible data breach we’ve seen, and its impact was immediate, resulting in a drop of three to four percent in the number of transactions at Target on the final weekend before Christmas, according to Bloomberg. As well, Target shares fell three percent in the weeks following the breach. And at time of writing, there was talk of a customer class-action suit being launched against Target as well. I’ve come to know a great many CIOs over the 20-odd years that I’ve been writing content for the IT executive community in Canada. And quite often when I’m on a company’s web site I’ll check the management team section to find out who the CIO is and whether or not it’s someone I know. And it’s a source of continual amazement to me how often CIOs are left off the management team list. Doesn’t seem to matter what type of business it is – all industries are more or less equal offenders when it comes to snubbing their CIOs. Try doing a straw poll of company web sites yourself and see what I mean. You’ll probably find that around half the companies you visit have an invisible CIO. Pity the poor CIO. Seems like every time you turn around, somebody’s trying to poke his or her ‘I’ out. The once venerable title Chief Information Officer is now passé – no longer suitable, according to the pundits. These days it’s all about innovation; it must be Chief Innovation Officer. Or it’s all about intelligence; it must be Chief Intelligence Officer. I’ve even heard Chief Imagination Officer, which should only be allowed if you work for The Walt Disney Company. My Concise Oxford Dictionary has 46 pages of I’s, so this could go on forever. In order to save us a little time, allow me to cut to the chase and offer up the best new titles for CIO that are likely to emerge over the next decade or so. That way we can play with them now, quickly grow tired of them, and get back to good old Chief Information Officer. For fun, see which of the following titles fits you best. If I won the lottery, I would move my entire family to Disney World, permanently. My plan is simple: give away and sell all my worldly possessions, from my socks to my house, and recreate a new life in the happiest place on earth. I would prepay for decades of a complete vacation package in a Magic Kingdom view resort room, with a connected room for the kids. For transportation, WDW would provide busses, boats, and monorails to any location, all included. For food, the included deluxe dining plan would offer me three meals and two snacks per day in hundreds of locations in the 40+ square mile district. I think the entertainment is obvious, however I would likely get the platinum package with park hopper and waterparks to maximize the number options in any one day. For clothing, well, onsite merchandising is unprecedented. A couple of weeks ago, a CIO and long-time friend of mine sent me an email, letting me know that he’s looking to change jobs after 15 years with the same firm. He knew that I was well connected with the CIO community in Canada and hoped I might be able to help him with his job search. Good call on his part. As it turned out, I did know of a couple of IT executives on the move and was able to broker a meeting between my friend and one of those departing CIOs. As for the other, his job had already been filled internally. My friend just emailed to tell me the meeting went great and thanking me for putting him in touch with “an excellent resource and even better person”. Knowing my friend, I’m sure the meeting was mutually beneficial. Over the past couple of decades I’ve met many CIOs with aspirations to move out of IT and up the corporate ladder. Some succeeded; many more did not. Despite the advantage of being an executive with a view across the entire business, it’s simply not an easy task for the CIO to break out of IT. The reasons for this are many: the CIO is a relative newcomer to the executive suite; in many organizations there’s a lack of connectedness between the business and IT; many see IT as a cost centre rather than a strategic tool for innovation and revenue generation; IT has a long history of project failure and underperformance in the eyes of the business; and the list goes on. Even though the Canadian IT executive community is small, it’s surprising how often CIOs who have been made to walk the plank – often through no fault of their own – sink out of sight with barely a ripple. They may let a few of their close associates know, but the broader IT executive community is none the wiser. By the time they hear about it, it’s several months after the fact. Unfortunately, there are a lot of very capable ex-CIOs out there who want to continue their careers but who’ve spent too long on the sidelines. They’re now not only unemployed but also stale-dated. If they find a CIO job at all, it will likely be one of considerably less stature than their previous one. While relatively few companies have seriously mined social media for such insights, some of the CIOs attending The IT Media Group CIO Roundtable exploring The Economics of Big Data shared some initial experiences that point to the intelligence value social media promises. More than any other C-suite executive, CIOs are given to collective self-examination and tireless speculation on the future of their profession. That’s not surprising given the fact that CIOs are relative C-suite newbies, and in many companies, even in today’s digital world, are still not accorded equal standing with their executive peers. Since IT managers began morphing into CIOs in the 1990s, the role of the CIO has been a moving target, affected by the rapid pace of technology change, huge shifts to the IT service provider market, varying trends in the corporate view of IT, and increasingly demanding communities of customers and end-users. Little wonder that even some of the best CIOs have had difficulty coming anywhere close to hitting the bull’s eye of this moving target. The good news: According to Robert Half Technology’s most recent quarterly survey, Canadian CIOs plan an increase in IT staffing activity in the fourth quarter of 2012. It’s a sign of growing corporate confidence in the economy and in information technology as a means to take advantage of it. The bad news: There’s already a shortfall in the skills most in demand. The Outlook for Human Resources in the ICT Labour Market, 2011-2016, a report produced by the Information and Communications Technology Council (ICTC) working with the Information Technology Association of Canada (ITAC), predicted that between 2011 and 2016, Canadian employers will need to hire some 106,000 ICT workers—more than 17,000 per year. John Tolkamp, IT Director at Ainsworth Engineered talks about changes in business and IT that affect how the two interact. 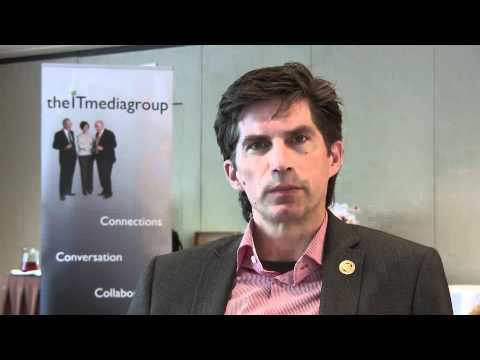 His comments were recorded following The IT Media Group Roundtable “Winning Tactics for Hard Times”, in Vancouver, March 27th 2012. Ever since Nicolas Carr’s famous (or infamous, depending on your point of view) article in the May 2003 issue of the Harvard Business Review, “IT Doesn’t Matter”, CIOs have held a mirror up to themselves and their profession, nervously looking for any tell-tale wrinkles that may signal the beginning of their decline. In the years since Carr’s article, commoditization of IT, cloud computing, Software as a Service and other technologies have become significantly more prevalent, indeed making many aspects of enterprise IT mere table stakes, providing little or nothing in the way of competitive advantage.